In her fourth illustrated book, the artist and author of the bestselling The Time-Traveler’s Wife explores her signature themes of transformation and love. The fable begins when a postman falls in love with a raven. Their daughter looks like a girl but feels like a bird. Longing for wings to stretch, she finds a doctor who may be able to help her. Raven Girl and Awake in the dream worldThe Swedish Museum, 5211 N. Clark St., ChicagoAudrey Niffenegger will be discussing her two new books, Raven Girl and Awake in the dream world: The Art of Audrey Niffenegger (the latter is the catalog of her upcoming one-woman show at National Museum of Women in the Arts in Washington, D.C.). Raven Girl, an illustrated novella, is a dark story, full of wonderment and longing, the tale of a postman who encounters a fledgling raven and decides to take her home. The unlikely couple falls in love and conceives a child—an extraordinary Raven Girl trapped in a human body. Raven Girl explores the bounds of transformation and possibility and challenges popular opinions of what contemporary families, romantic relationships, and bodies should look like, encouraging readers to open their hearts and minds to a new kind of fairy tale. Audrey Niffenegger is the author of the many books, including The Time Traveler’s Wife, Her Fearful Symmetry, and The Night Bookmobile. The Enchanted Life of Adam Hope is an unconventional and passionately romantic love story that is as breathtaking and wondrous as The Time Traveler’s Wife and The Story of Edgar Sawtelle. During WWII, teenager Evelyn Roe is sent to manage the family farm in rural North Carolina, where she finds what she takes to be a badly burned soldier on their property. She rescues him, and it quickly becomes clear he is not a man…and not one of us. The rescued body recovers at an unnatural speed, and just as fast, Evelyn and Adam fall deeply in love. Our great Sci-Fi Book Club meets the 4th Monday of each month at 7pm. They are a fun and welcoming group, so give them a try one month. Their reading selections vary between old school scifi, fantasy, and new scifi trends. You are certain to find a book you will enjoy. The March selection is The Time Traveler's Wife by Audrey Niffenegger. Audrey Niffenegger promotes The Night Bookmobile. Audrey Niffenegger's book Shadow Show was available from LibraryThing Early Reviewers. Audrey Niffenegger is currently considered a "single author." If one or more works are by a distinct, homonymous authors, go ahead and split the author. 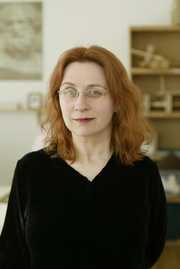 Audrey Niffenegger is composed of 20 names. You can examine and separate out names.